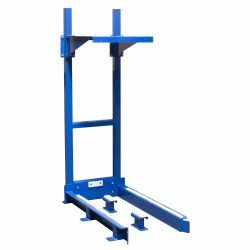 The BHS Fork Access Battery Stand (BSFA) is the perfect solution for lift trucks that don’t have battery roller beds and require battery exchange with a pallet truck. This rugged, powder-coated stand stores a single battery in a wide range of sizes. BSFA’s include the option of vertical-mount or shelf-mount use and additional models are available with no charger shelf. Models are compatible with either 18- or 27-inch pallet trucks and can accommodate batteries up to 50 inches long. Spark-proof UHMW polyethylene resting strips prevent direct contact between the battery and stand. An additional UHMW strip on the back rail further isolates the battery. Welded system feet with anchor holes firmly secure the stand, and angled front rails aid in guiding the pallet truck into stand. Trust the heavy-duty Fork Access Battery Stand to store or charge your valuable industrial batteries. Contact our sales team at +1 314 423 2075 to learn more about Battery and Charger Stands or to find a local dealer.